Now, for the second part of this series, I would like to interview the two men behind the development of the Wii Balance Board, the world’s first game accessory capable of measuring your weight and body balance. It’s interesting to note here that the two are from completely different divisions: one is from the Entertainment Analysis & Development Division, which develops software, and the other is from the Integrated Research & Development Division, which develops hardware. 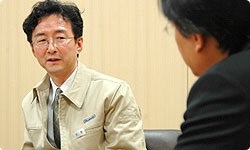 I’d like to first ask Mr Sawano to introduce himself and describe his responsibilities in developing Wii Fit. 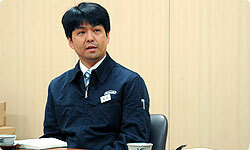 I’m Takao Sawano from the Entertainment Analysis & Development Division. I was the producer for the Wii Balance Board in the Wii Fit project. It’s true that my division is responsible for developing software, but, partly because I used to work in the hardware division, I decided several years ago to bring in an employee who had experience in hardware development so that we would have the freedom to develop, at the least, hardware prototypes on our own. This employee, Yamazaki-san, worked together with us in developing the Wii Balance Board and was supposed to attend this interview, but he had to fly to China today on business and so, unfortunately, will not be with us for this interview. 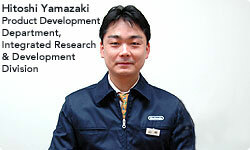 I’m Takeshi Nagareda from Development Group No. 2 in the Integrated Research & Development Division. I was project leader for the development of the Wii Balance Board. Before that, I was mainly involved with the development of the Wii console, handling the design of elements such as the Wii console’s motherboard and AV output circuits. While Wii was in development, if there was a problem with a visual component of the console such as the graphics, I would be the first to know about it. That’s why I had many opportunities to talk to the people in the Entertainment Analysis & Development Division, and I have a feeling that’s how I ended up getting to work on the Wii Balance Board. Is this the closest you’ve ever worked with software? No, I was also involved in software development when I was designing the circuitry for the DK Bongos1. That was a joint project with Namco. 1 Barrel-shaped controllers developed for the Nintendo GameCube. Of course, for Donkey Konga2. That, I would imagine, was easy to visualise as a new type of game controller. This time, though, you were asked to make an accessory that could act like bathroom scales. (laughs) When you were asked to develop this, what was your first reaction? 2 A rhythm action game developed with Namco for the Nintendo GameCube that was released in October 2004 in Europe. I was also wondering how this could to be turned into a gaming accessory. In fact, there was even some talk in the past in our division about developing a controller that would utilise scales technology, but this was way before I began working with Sawano-san. Wii Fit was known as Health Pack in the early stages of development, which of course your boss, Mr (Genyo) Takeda3, knew about. 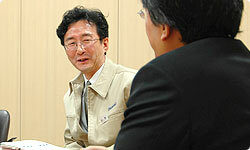 3 General Manager of the Integrated Research & Development Division responsible for home video game consoles such as the N64, Nintendo GameCube and Wii. It was around that time that a bunch of us from our division began visiting a number of manufacturers of bathroom scales. We found a few companies interested in the idea of bringing an accessory similar to bathroom scales into the gaming market, but because there were virtually no successful examples from the past, we were unable to convince any of them to dedicate themselves to this project. It sounds like a wasted opportunity now, but I suppose it was inevitable considering we had no idea what the final product was going to look like and were unable to provide any details at the time. Changing the subject a bit, Sawano-san, you were working on something else before the Wii Balance Board, weren’t you? I was leading the development of a software title called Ningen Copy Manebito4 for the Nintendo GameCube. As part of the project I worked with Yamazaki-san, who is visiting China today, on creating a camera attachment for the software. The software would have allowed users to import their portraits and create their own original characters. Unfortunately this product never saw the light of day, but what we started there did eventually come to life in the form of Mii characters. After that, I began work on our project for Shigureden5. This project involved a lot of time coming up with ideas and tinkering with prototypes, and Yamazaki-san was a tremendous help. There’s a DIY shop near the company, and as soon as we were finished discussing our ideas, he would go there, get the materials and come right back so we’d have a prototype ready in no time. In the actual Shigureden there are 70 monitors6 imbedded in the floor, and we did all sorts of things to try to visually present that idea during our presentations, such as lining rows and rows of tape on the floor. 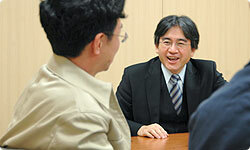 You saw our presentation, didn’t you Mr Iwata? 4 Software based on the engine of the cancelled Stage Debut, announced in 2002. It would have allowed users to take pictures of people using the GameEye for the Game Boy Advance and import them into the software to map their portraits onto their own original characters. 5 An exhibition facility themed around the Ogura Hyakunin Isshu (a classic anthology of 100 traditional Japanese poems from the 7th to 13th centuries composed by 100 poets) built in Arashiyama, Kyoto, in January 2006 and operated by the Ogura Hyakunin Isshu Cultural Foundation. 6 The floor of the Shigureden is covered with wall-to-wall monitors that offer content revolving around the Ogura Hyakunin Isshu that visitors can access with a special Nintendo DS called the Shigureden Navi. Anyway, that’s how Yamazaki-san works, so whenever I’m working with him, anything at the idea or conceptual stage quickly begins to take form. In the case of Shigureden, the final form was the result of several of these attempts to give form to ideas or concepts we’d brainstormed. Like with Wii Fit, designing a museum like Shigureden was an entirely new experience for Nintendo, and I think there were a lot of similarities in the ways we approached both projects. We’d test idea after idea with our own bodies and, in the process, make realistic decisions about which technological elements to keep and which to discard. Nagareda-san touched on this earlier, but we also visited many manufacturers of bathroom scales and bought several scales that we studied in detail. The only thing Miyamoto-san had told us was that he wanted to make a game that would allow users to weigh themselves on a daily basis, so that’s really all we could do at the time. One company even offered to introduce us to a factory in China. (laughs) These days, scales are so technologically advanced that it seemed that nobody was interested in making a device that would simply measure your weight. And so, eventually, we decided we’d have to make it ourselves. We asked the companies that make Nintendo’s game accessories for help, and we started working jointly on developing this new piece of hardware. Initially then, you attempted to plough through the development of the Wii Balance Board on your own, without handing over the process to a hardware development team. What problems did you encounter during that phase? We were developing a piece of hardware that was to be bundled with a piece of software, so if we couldn’t keep costs down, we wouldn’t be able to sell it. Because of this, the first thing we did was to challenge ourselves to push the cost down as much as possible. In the discussions with our development partners, it became clear that using the parts present in typical bathroom scales alone would have made the product much too expensive. We were, essentially, trying to do something that had never been done before. Eventually, we hit upon the idea of using the Nintendo 647 Controller. An optical rotary encoder had been built into the 3D stick8 of the Nintendo 64 Controller, and we decided we could use this encoder in our hardware as well. This was something we’d never attempted before, so it looked like it would be a lot of fun to work on, and we eventually discovered that the encoder could measure weight to a precision of 100g. 7 Nintendo 64, a console that debuted in June 1996 in Japan and March 1997 in Europe. 8 A stick located in the centre of the Nintendo 64 Controller that allowed players to move characters around a 3D space. By the way, this might be a bit technical, but a rotary encoder is a device that measures the number of rotations made by an object. If a depression were to cause a series of cogs to rotate, you would be able to measure weight pretty accurately using a rotary encoder. Exactly. I thought that was a pretty good idea, so we first created a prototype. But then we hit upon another problem. Most homes already have bathroom scales, don’t they? Most homes do have scales, and I can’t imagine people putting them in front of their TVs. I knew that we needed to do something about this problem. Then suddenly, one day while I was at home, this image of sumo wrestlers passed through my head. Sumo wrestlers are so heavy that when they weigh themselves, they need to step onto two scales laid side by side. I started thinking about this, and thought that it could be really interesting. So I told Yamazaki-san to bring me two scales that can transfer data to a computer, and we immediately started working on a prototype. So the idea for measuring balance came from the way sumo wrestlers are weighed!